Man United team enter the match with momentum on their side after beating Everton in the English FA Cup Semifinals on Sunday. They are locked in a titanic battle with Arsenal and Man City for the final Champions League places. They have won six straight league matches at Old Trafford and haven't conceded there in 381 minutes since beating Arsenal 3-2 on Feb. 28. The Red Devils have only conceded seven goals at home in the league all season. Louis van Gaal may name an unchanged side even if the likes of Juan Mata, Schneiderlin and Herrera will all be pushing for recalls having been left out against the Toffees last time out. Jesse Lingard and Martial look set to continue out wide, with Marcus Rashford starting as the lone striker. Luke Shaw, Bastian Schweinsteiger and Will Keane remain sidelined. Phil Jones stepped up his return to the first-team squad with the U21s in midweek and may come into consideration. Leicester City team head into Sunday’s game on the back of their stunning 4-0 win over Swansea at the King Power Stadium last weekend, a victory that have seen them moving seven points clear of Tottenham at the top of the league table with three games left. Leicester have won 6 of their last 7 league matches and kept a clean sheet in 6 of the last 7 as well. 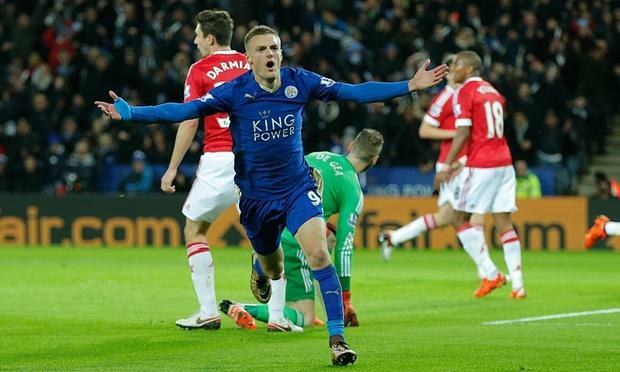 Claudio Ranieri will again be without Jamie Vardy for the trip to Old Trafford. Ulloa could fill in once again following his brace, although the striker is suffering from a back injury and will be assessed closer to the time. Jeffrey Schlupp started on the left of the 4-4-1-1 formation last weekend, and may keep his place ahead of Marc Albrighton. Newly-crowned PFA Player of the Year Riyad Mahrez, Danny Drinkwater and N’Golo Kante are expected to form the rest of the midfield, with Shinji Okazaki operating in the support striker role. The reverse fixture this season ended in a 1-1 draw at the King Power Stadium as Schweinsteiger cancelled out Vardy's opener - a goal that saw Vardy score in a record 11th consecutive league game. Manchester United have won their last 6 home matches against Leicester in all competitions.